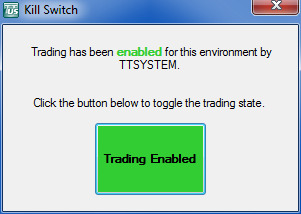 TT User Setup provides a trading “kill switch” that you can use to disable trading for your entire trading environment. The global kill switch exists in the X_TRADER ASP environment, and, when applied, will only "kill" trading for the memberships that you have configured. New orders, including Wholesale (OTC) orders, are rejected on all TT Gateways in the environment. Existing orders remain working at the exchange unless canceled via a trading administrator login (TTADMXXXMGR) or Admin Delete utility. Users cannot modify or cancel any working orders. Order actions on existing orders are rejected by the TT Gateways. Users continue to receive fills and exchange notifications (the TT Gateway sessions remain active). The same behavior is true when trading is disabled in a X_TRADER ASP environment by a Broker Administrator, except that new orders are rejected on gateways in the broker company’s environment only. 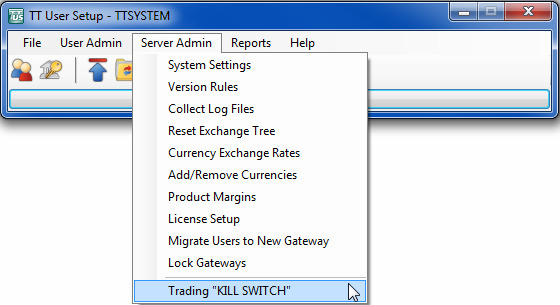 From the Server Admin menu, select Trading “KILL SWITCH”. The Confirm Kill Switch window appears. Type “yes” in the Confirm Kill Switch window to disable trading. 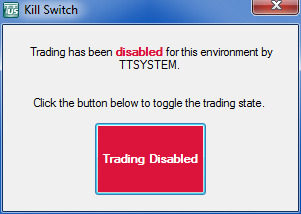 The Kill Switch window appears, indicating that trading is disabled. Note: When the trading state is toggled (e.g., from disabled or enabled), a system notification is sent to each connected TT User Setup client in the entire environment (non-X_TRADER ASP) or broker company environment only (X_TRADER ASP). To enable trading, click the button on the Kill Switch window to toggle the trading state. When you toggle from Trading Enabled to Trading Disabled, you will be prompted again to confirm a stop to all trading in your environment. At the account level, you can use the "Trading Allowed" setting to disable trading. This is a dynamic parameter that takes effect immediately and prevents any new orders from being entered. 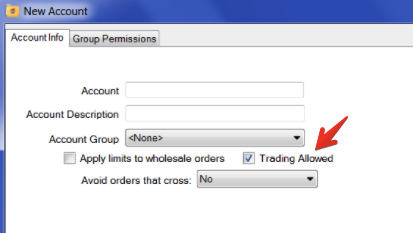 When setting risk limits as an administrator, the Trading Allowed option can be set for an account, account group, or user. As a risk administrator, you have the ability to add accounts to account groups to shut off trading for a group of accounts all at once. The following example shows Trading Allowed set at the account level. You also have programmatic access to the TT User Setup API, so you can develop logic in an application that could achieve this or something similar by rapidly disabling trading for multiple accounts. You can integrate your risk systems with the TT User Setup API and TT's FIX API to monitor trading, then take automatic action to disable trading if needed. As a trader, you can use the X_TRADER Order Book and MD Trader to cancel all of your working orders. For example, you can filter the Order Book by account or algo, and click Cancel All to remove all working orders. To filter an account, click the Account Number header and select an account.